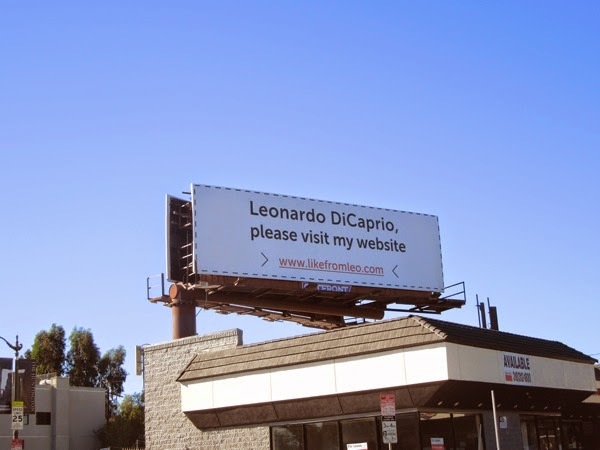 'Leonardo DiCaprio, please visit my website'. 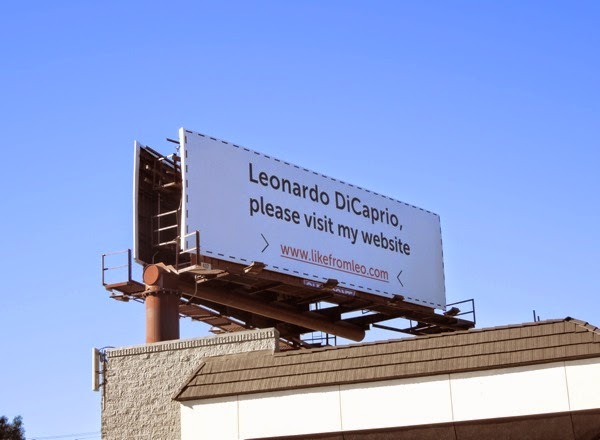 No, this is not a desperate plea from Daily Billboard to get the Titanic and The Wolf of Wall Street star to visit this blog (if only we were that clever), but this genius idea belongs to a Russian environmentalist who wants the eco-friendly Hollywood activist to support his recycling efforts in his native country. 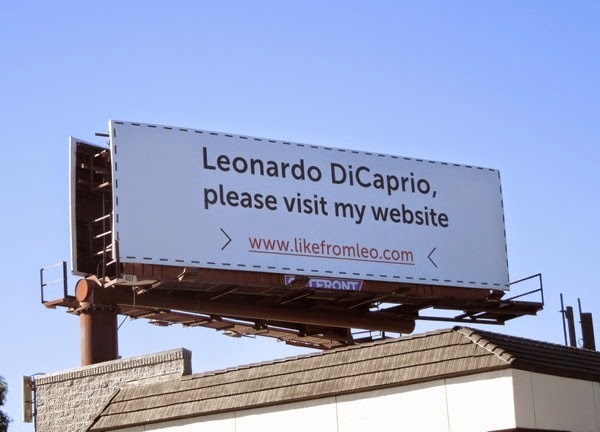 Using a Indiegogo crowdfunding campaign he's raised the funds required to pay for a $15,000 billboard in L.A. to draw Leonardo DiCaprio's attention (and ours) to his waste-sorting efforts in his home town of Ostashkov, in an effort to inspire his townspeople by getting the endorsement of a famous celebrity. What a great, innovative idea. This simply executed, but intriguing proposition billboard is a brilliant piece of publicity, and was snapped at the busy intersection of Olympic and La Cienega Boulevards in Los Angeles on November 26, 2014. Unfortunately this ad location doesn't get direct sunlight at this time of year (obviously this is what $15,000 buys you), but it still caught Daily Billboard's magpie eye. Only time will tell whether Leonardo DiCaprio will actually 'like' the campaign at the website LikeFromLeo (be sure to check out the video there for the full story), but we hope so (although the cynic in us, hopes this isn't just some elaborate hoax).